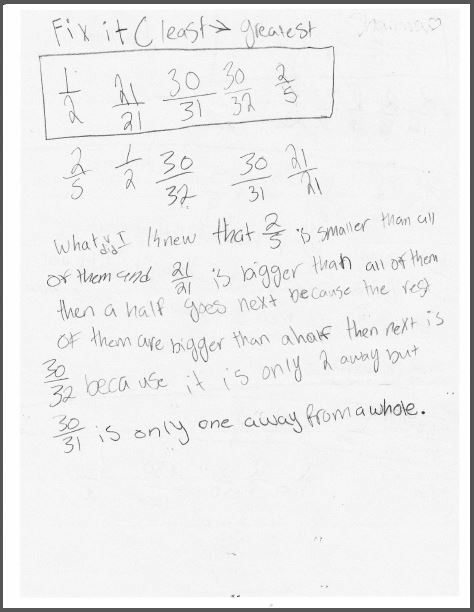 This post was originally published on Marilyn Burns’ Math Blog. Involving students as creators of problems for others to solve provides an experience for them that’s different from the teacher always being the source of problems. Also, when students have opportunities to solve their classmates’ problems, I find that they invest in their learning in a different way, often with added interest. 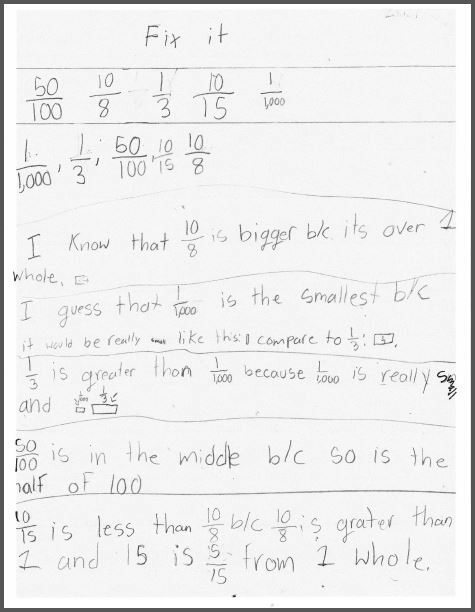 And a benefit to teachers is that reviewing the problems that students create is useful for assessing their progress. Here’s what I did with fifth graders studying fractions. I wrote five fractions on the board, as shown above, purposely writing them out of order. I told the class, “Your job is to ‘fix’ what I wrote so that the fractions are in order from least to greatest.” Using think/pair/share, I asked students first to think on their own and then to confer with a partner. Next I called on students to share their ideas, each time asking them to explain their thinking. We repeated this for two other sets of fractions. Then I explained to the students that they were going to create “Fix It” puzzle cards for their classmates to solve. I wrote directions on the board for what they needed to do before making their puzzle card. I explained as I wrote each direction. The students were interested in the project and began work eagerly. Meanwhile, I set up a folder for their papers so all of their solutions would be easily accessible. As the class worked, I circulated and observed. 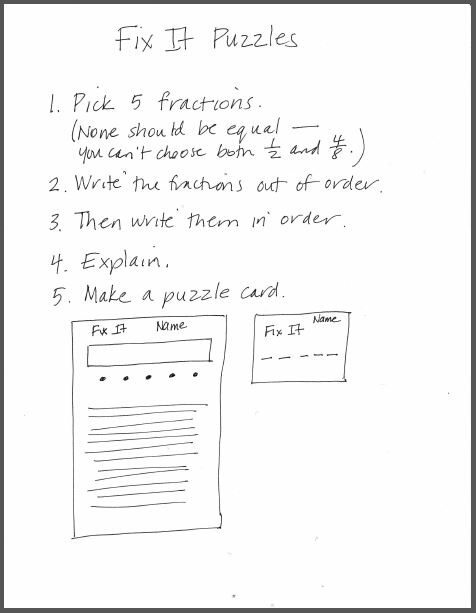 When I approved students’ papers, I gave them an index card so they could make their puzzles. I asked those who finished first to exchange puzzle cards to solve, reminding them that they had to write their explanations. For a while as students were working, I sat with Fatima, a girl who had missed a good deal of school the year before and was struggling to keep up. She had written five fractions: 4/8, 1/3, 3/5, 3/6, 2/3. But she had no idea what to do next. I suggested that she start with a different set of fractions. “Write five different fractions that all have a 1 on the top as the numerator.” Fatima drew a rectangle and in it wrote: 1/5, 1/2, 1/8, 1/4, 1/7. 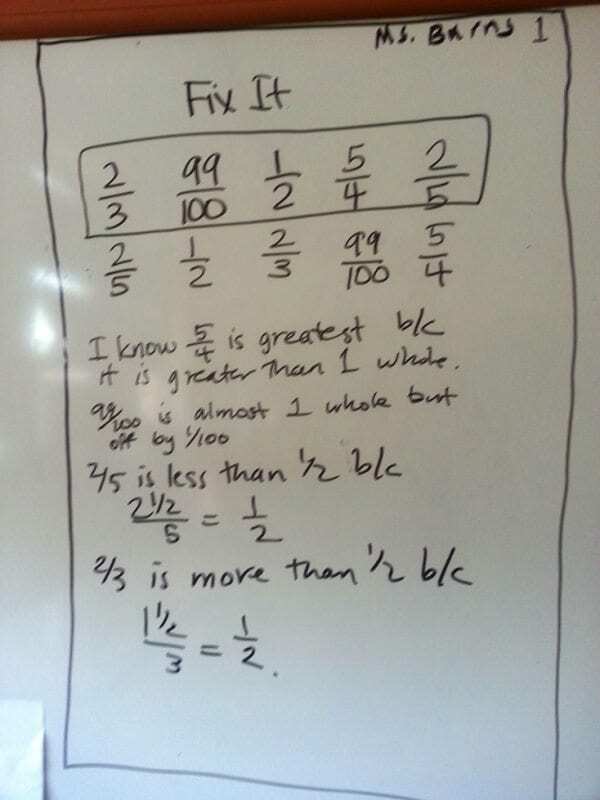 “Can you put these fractions in order from least to greatest?” I asked. 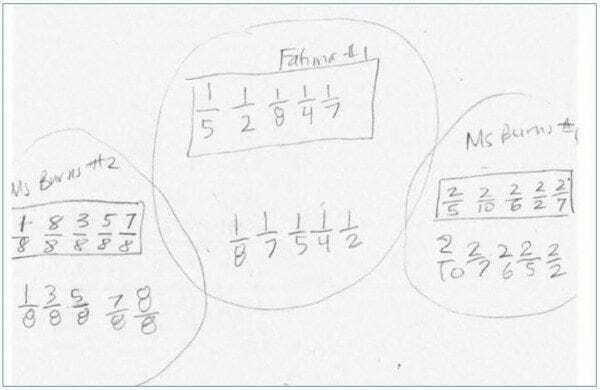 Fatima nodded that she could and reordered them correctly: 1/8, 1/7, 1/5, 1/4, 1/2. She explained, “The bigger number on the bottom means that the pieces are smaller.” I circled Fatima’s work and labeled it Fatima #1. “Now I’ll write five fractions out of order and see if you can fix it,” I said. I drew a rectangle and in it wrote: 2/5, 2/10, 2/6, 2/2, 2/7. Fatima was able to reorder these correctly and explained, “It’s like the other one, but there are twos on top instead of ones. I circled this set and labeled it Ms. Burns #1. “Want to try another?” I asked. Fatima agreed, feeling a bit more confident. 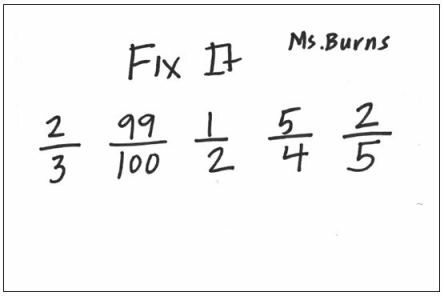 For the next set, Ms. Burns #2, I wrote five fractions that all had the denominator of 8: 1/8, 8/8, 3/8, 5/8, 7/8. “I can do that,” Fatima said and reordered them correctly: 1/8, 3/8, 5/8, 7/8, 8/8. My time with Fatima gave me information about what she understood so far. I relied on my long-time favorite—Fraction Kits—to help her move forward. Solving “Fix It” puzzles became a choice on the math menu for fractions, and students solved each other’s puzzles over the next week. I taught this lesson last spring in Sara Liebert’s fifth grade class in John Muir Elementary School in San Francisco. 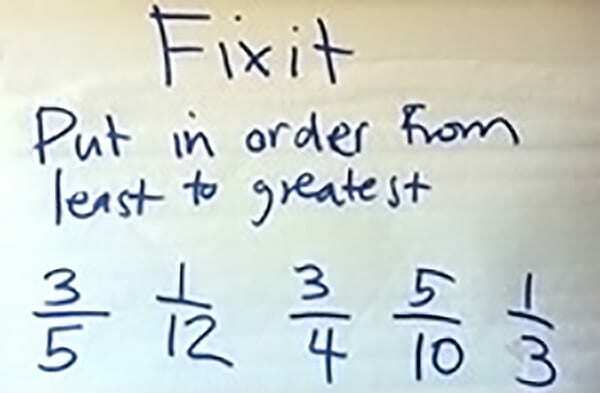 “Fix It” appears in the Do The Math intervention program, Fractions, Module B, Lesson 28. My colleague, Lynne Zolli, gave me the idea of having students make puzzle cards for the Fix It activity.